LUMPENPROLETARIAT—Who says you can’t fight city hall? Community activists and organised labour were out in force at a morning rally outside of Kansas City, Missouri’s 26-story City Hall building at 11:00 CDT. 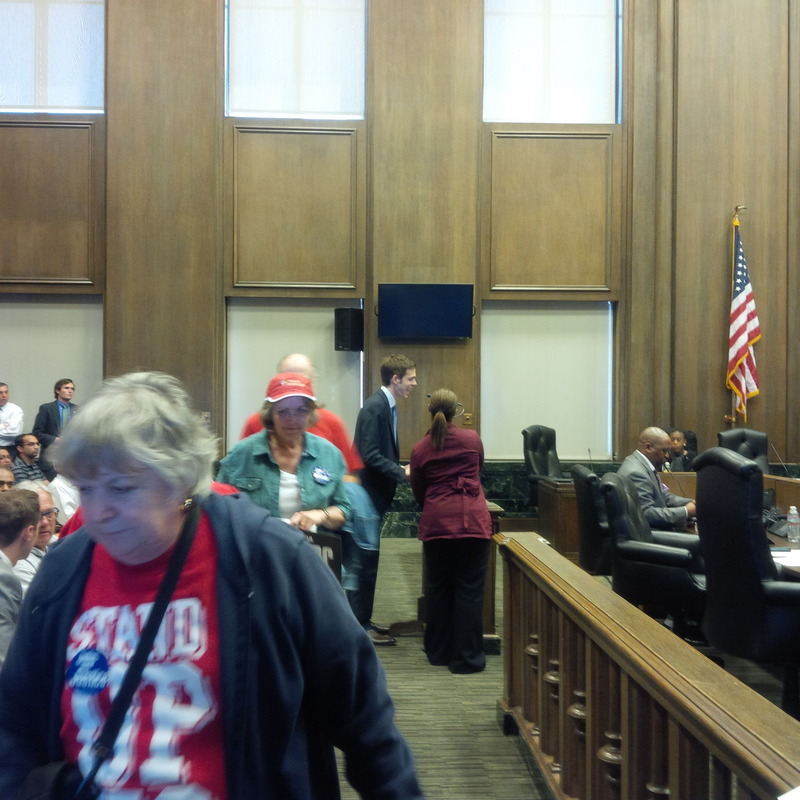 At noon, people crowded the Kansas City Council Chambers to bear public witness to the hearing and the arguments for, and against, raising the minimum wage in Kansas City. The University of Missouri-Kansas City’s heterodox economics department reprazented today at the Fight for $15 protest rally and hearing on the 26th floor of Kansas City, Missouri’s stately City Hall. 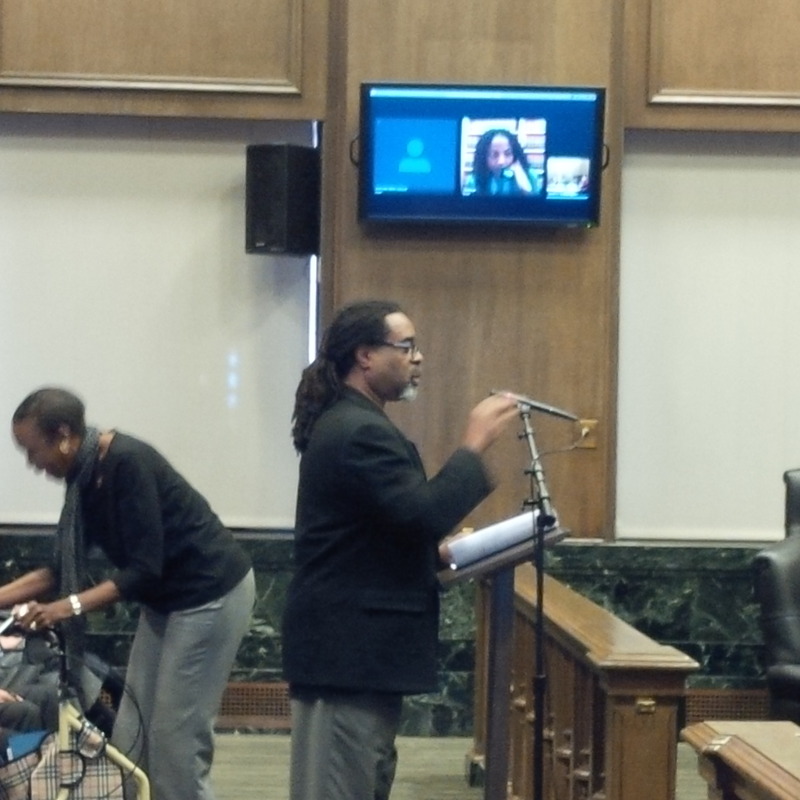 DR. TAUHEED: “Mayor Pro-Tem, Members of the Kansas City Council, my name is Linwood Tauheed. I am an Associate Professor of Economics at the University of Missouri-Kansas City. The presentation, which I am going to give—of which I have a small slide show; you can bring it up in a minute [inaudible—is based on a report done by a colleague of mine, Mathew Forstater, who was not able to attend today. So, I am. “I think that you have a copy of his report. “And this idea of raising the minimum wage is, obviously, catching on around the country. And we have lots of evidence. We have lots of empirical evidence, that we can point to now, that, ten years ago, we didn’t have, in terms of the economic and social effects of raising the minimum wage. And, so, this particular slide show is on the social and economic benefits of raising the minimum wage in Kansas City, Missouri. “Missouri has seen a steady, ongoing decline in the real wage since 1975. DR. TAUHEED: “I think this is all I have. So, what the slide show was, essentially, is a summary of the [inaudible]. And I know the Council is looking for, and will be looking for data, for studies. And, so, let me give you, perhaps, what I think is some guidance. “I’m a methodologist. I teach methodology. And studies have to be done in a certain way. And some ways of doing things or arriving at conclusions are better than others. And the first study of a minimum wage, that was done in this country, that was substantial, was done by David Card and Alan Krueger in 1995. And that was a study between the State of Pennsylvania and the State of New Jersey. The State of New Jersey had increased its minimum wage, while the State of Pennsylvania did not yet increase its minimum wage. “And, so, there was a study to see if there was job loss in New Jersey to Pennsylvania, as a result of the increase in minimum wage. And what that study showed was that there is no job loss. Now, I’m from Philadelphia. I’m right from the border between Pennsylvania and New Jersey. And lots of people go from Philadelphia to Camden, or Camden to Philadelphia to work. In this study, it was very easy to go across the bridge. This study shows no effect [in terms of job loss of] increasing the minimum wage. DR. TAUHEED: “So, this is a natural experiment. Right? [scant audience laughter] And this is as close as you can get to the cream of the crop in methodology. And that’s a natural experiment. “And, so, to have natural experiments is to have things happening in one place and not something happening in another place, that was very similar. You can study that and see what the effects are. “And, so, there was testimony about an experiment at the county level with counties to see if there was a minimum wage effect. There are other methodologies, which are generally used. Then a “Michael Saltsman,” a young man, a lobbyist, apparently, stepped up to the microphone and began, like the lobbyist for the restaurant industry before Dr. Tauheed’s presentation, to argue against raising the minimum wage. He would go on to cite several major cities as examples. “My name is Michael Saltsman, I’m the Research Director at the Employment Policies Institute, which is a think-tank in Washington, D.C.
“I did grow up in Michigan, so I was [inaudible] here in the Midwest. So, it’s good to be back here. But a Stand Up KC contingent simply got up and walked out. By this time, many audience members and pro-wage raise activists seemed to be growing weary with the slow pace of the hearing. SALTSMAN: “And what I wanna do in my brief time today is try and move beyond the rhetorical debate and provide some perspective on the actual minimum wage effects we’re weathering right now in the Cities of Oakland, Seattle, and San Francisco, where a high minimum wage of, either, $12.25 or $15 dollars an hour is, actually, having an effect already or it’s phasing in, in the present. “Some of this information has been reported in the San Francisco Chronicle and other newspapers. We’ve also conducted extensive surveys of hundreds of different [inaudible] in the West Coast. And what we’ve seen thus far is that the cost of these [inaudible] has been much larger than proponents anticipated. “So, in the City of Oakland, for instance, the minimum wage rose from $9 an hour to $12.25 an hour on March First of this year. In a survey of over 220 businesses in the city, we found that 30 percent had reduced their employees’ hours or their hours of operation. 17 percent had laid off employees. About one in ten said they were very likely to close. Now, let me give you a few good examples. There were ten restaurants and grocery stores in the city’s [inaudible] that were gonna close. They each had some partial consequence of the wage increase. Restaurants in the City have raised prices by as much as 20 percent. Some compare those prices increases with [inaudible]. STAND UP KC—Today, 48,000 Kansas Citians are employed in some of the world’s largest and most profitable fast food and retail corporatio…ns. But they work in our city’s worst paying jobs. Learn more at STAND UP KC. 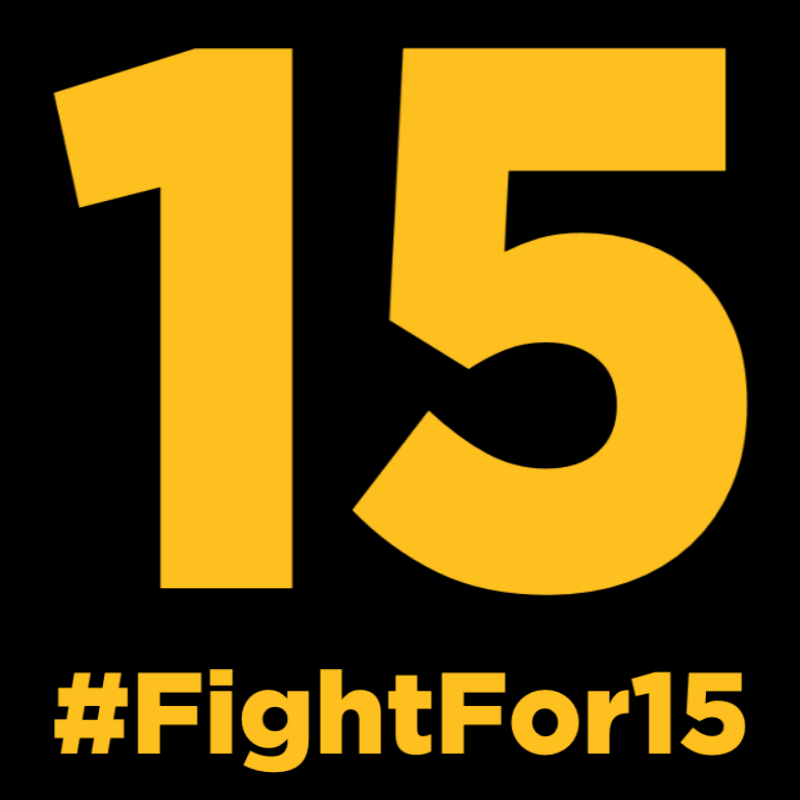 #FIGHT FOR $15—Fast-food workers have come together to fight for fair wages and the right to form a union without retaliation. We work for corporations who are making tremendous profits, but do not pay employees like us enough to support our families and to cover basic needs like food, health care, rent and transportation. These are billion-dollar companies that can afford to pay their employees better. When workers are paid a living wage, not only will it strengthen the economy but it will also reduce crime in our neighborhoods. Learn more at #FIGHT FOR $15.